This is a huge accomplishment for us, a milestone that makes us realize how much our work pays off when we can return two thousand newly-sober people to communities near and far. Every Friday night at this Watsonville, California drug rehab center, Narconon staff and students in recovery celebrate the milestones achieved that week. The March 1st graduation ceremony was a little more special. Narconon Vista Vay was graduating its two-thousandth person who had completed their long-term rehab program. Among many guests showing their support and respect were a Watsonville City Councilwoman and local Sheriff's Department Deputy. Throughout the ceremony, those who had completed one or another phase of the Narconon recovery program and its two most recent full-program graduates had the chance to tell the audience about their life successes. 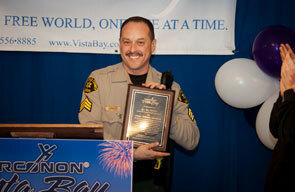 On this Friday night, Narconon Vista Bay celebrated graduates number 1999 and 2000. The two-thousandth graduate stood up to introduce his mother and thank his brother for taking action when his drug abuse had gone far out of control. "I've been in four or five other rehabs," he said, "and they cannot touch what we do here. It's not just 'get a book, read it and come back and take a test,' it's an experience that went on for five months. I know there is really something special here. As I learned to face the harm I had done and take responsibility for it, I found a new freedom in my life." 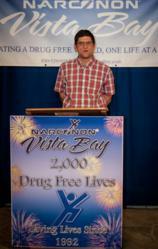 Rigo Ubillus, community affairs director for Narconon Vista Bay, proudly addressed the audience: "This is a huge accomplishment for us, a milestone that makes us realize how much our work pays off when we can return two thousand newly-sober people to communities near and far." Ubiluus praised the local community as well for its support of the center over the twenty years. "We've worked with government and law enforcement personnel to help reduce problems from drug abuse and addiction," he said. "While we have helped people from all over the US, we also have provided hands-on drug rehab and drug prevention services to the cities and towns around us." In recognition of this achievement for both the rehab center and the community, a Watsonville Councilwoman presented the two graduates with certificates of accomplishment from the city. And the collaborative efforts of the Santa Cruz County Sheriff's Department and Narconon were recognized with a plaque for the Deputy Sheriff present that night. "Narconon staff and members of the Sheriff's Department have staged many drug prevention events as well as toy drives," said Ubillus. "We at Narconon appreciate their dedication in helping us fight drug abuse, in helping keep the community safe every day." For more information on the Narconon programs or to find the nearest center to you, please call Narconon International at 1-323-962-2404.